These ecosystems are called the intertidal zones, a place between the high-tide and the low-tide mark. In this harsh environment – harsh for it is rapidly changing from being completely aquatic to being roasted under the tropical sun – life has evolved many special adaptations which allow it to thrive, and amongst the many intertidal ecosystems lay the mud forests – mangroves. 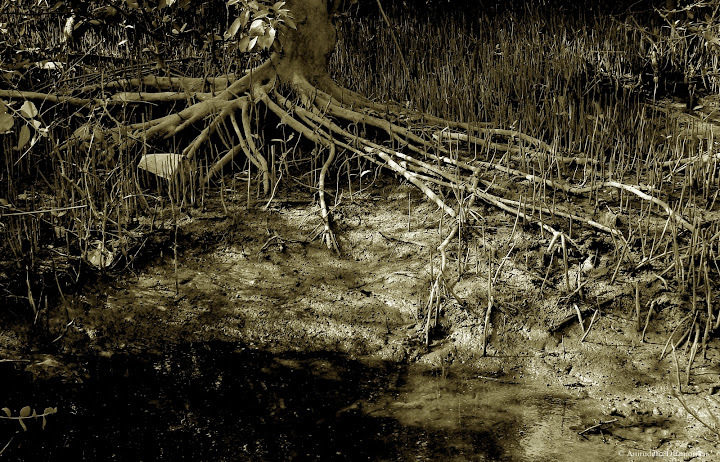 The mangrove forests are dense, dark, muddy, mysterious, eerie, and alien, amongst being beautiful. Stepping into these forests without the proper gear* is to lose one’s footwear (and one’s orientation) to the abyss of oxygen deprived, salt saturated nameless pit below. But there is a trick to get as closer to these trees as you can – the trick lies in following the footprints in the soft mud. And in these footprints lie the secret of the diversity of animals that survive here. From small mongoose and civet cats, to the deer and boar, and tigers to the elephants, mangroves have become a home for these terrestrial mammals as much as they are a home for myriad birds to feed, nest, and roost in. The mangrove forests of Konkan, where once also roamed tigers, are today often visited by Wild boar, Indian jackal, Chital deer, Common Indian mongoose, hare, rodents, and sometimes leopards. Yet these animals have merely adopted this place, and visit only during specific hours of the day – either during the low tide to feed upon or during night to roost in. The inhabitants of this habitat, for which these obligate and facultative migrants come, are somewhat of a different prowess – to survive in the hypoxic mud forests. Of all the multitudes of strange microscopic planktons, crustacean larvae, algae, et cetera, some catch our attention for their bizarre characteristics. The Fiddler Crabs of Konkan, Uca sp. are most abundant in the undisturbed mangrove and mudflat regions of estuarine ecosystems. Seeing them is to make sure that the habitat is cleaner of micro-pollutants, if not macro-pollutants such as plastics. But one cannot rely on them as an indicator species because they are found only in a particular niche, where the mud is not too wet or too soft. Another creature visible to the naked eye is the Mudskipper, a fish, of which Boleophthalmus boddarti is the most common. In the Konkan, not all mangrove forests are the same. In regions along the coast of Mumbai (northern Konkan), the mangrove forests are dominated by Avicennia spp., growing in the soft mud which can easily pull your feet to your knees. Avicennia is said to be the most resilient mangrove species in this part of the world, perhaps because the sedimentation, salinity, climate, and tidal range are to its liking. Although species such as Sonneratia and Rhizophora exist, they are uncommon to come by. The mangrove associates (plants which are found in the same habitat amongst the mangrove species but do not show all the typical characteristics of mangroves) are fairly common in the northern Konkan. Some of the densest patches of these can be found along Thane and Vasai creek. Mangroves are the most mystical forests of northern Konkan, also unfortunately because they are the most threatened. As you move southwards along the Konkan, you will be witness to some of the greenest mangrove forests embracing India’s peninsula. The mangroves here are diverse, as species of Sonneratia adorned with Orchids in their serrated groves, as well as Rhizophora standing tall on its stilt roots, dominate most of the estuarine shores. The overall mud here is hard and strong enough to walk upon during low-tide, and the expanse of these forests is mesmerizing. These forests are some of the most diverse and unspoilt by man. It is perhaps because urban expansion is not as rapid down here as it is up near Mumbai and the adjoining upcoming cities. But it is more so because people here understand the importance of these mangroves – not just people like you and me, but also local communities whose entire income is blessed by the mud forests. The estuarine beds of southern Konkan are rich and ideal hotspots for Edible Oysters (Crassostera spp.). Edible Oyster beds over here spread for several kilometers, and are harvested by the local communities (oystermen and fishermen) for consumption or for selling in the market – and this livelihood option is sustainable in many parts of the southern Konkan simply because it is done in the least destructive manner. During low-tide when a significant portion of the mudflats and mangrove forests are exposed to the air, small families of villagers sail in their boats to the Edible Oyster beds. During this time, the oyster beds close shut tightly when subject to the element of air in order to avoid desiccation under the tropical sun. The oysters are commonly called Saad or Bud Kaalve (Crassostera spp. ), found in subtidal areas with muddy to sandy bottom (Gagan et al, 2013 – a beautiful paper, recently published, documenting the indigenous methods the local communities use to fish bivalves in southern Konkan). With the help of a small hammer and an iron bar with a sharp end, the locals break open the mature oysters from the clump, and collect them in cane baskets. I do not know how the oysters taste, but they’ve been in demand for many decades – rather centuries. Unfortunately, it has also been considered unsustainable in the long run, so how environment-friendly is this harvest of natural edible oyster of the mud forests, really? A priceless book “The Present Depletion of the Oyster-bed of Sind [sic] – its causes and the remedies” authored by late zoologist James Hornell in 1923, documents the history of the rise and fall of the oyster industry in the Sindh region – mainly because of over exploitation of the edible oysters. It is said that there was no official cognizance for the fishery of edible ousters, and the industry paid no dues, nor was it under any supervision. The demand then remained local, and hence, “so long as this was the case the oystermen stated they had no difficulty in meeting the supply.” As the demand and distribution infrastructure grew, the oyster beds of Nawa Nar (in the western section of Karachi backwater) began to show the signs of exhaustion. Then something worse added to their misfortune – the pollution from upstream regions further polluted the waters and affected the oyster beds. When it came to the notice of the authorities, an in-depth analysis of the yield was undertaken, oystermen and fishermen were consulted, and the conditions of the beds were studied. And then, the worst followed. “Apart from the harm done by actual overfishing, a very serious abuse came to light during this enquiry; it was found that for greater convenience in sorting as well as for personal comfort during cold weather, it had been customary for the fishermen to load up their small boats with oyster clumps or clusters indiscriminately, transport them to some convenient place near high water mark, and there do the actual separation of marketable oysters at leisure”. It was followed by a cyclone, but the oyster beds recovered over the years, however the general yield decreased. The report says that the Nawa Nar beds no longer exist. This trend was observed over 100 years ago. Today, we’re again facing the similar dilemma. In the report “Conservation and Management of Mangrove Habitats and Associated Oyster Beds”, mangrove ecosystems are said to be suitable site for culturing oysters, however management of natural oyster beds is also considered crucial to ensure long-term sustainable yield. The remedies from Hornell’s and this report suggest monitoring of these beds, controlling overexploitation (eg. public awareness), and teaching suitable techniques for oyster culturing. What lies in the base of this remedy is completely overlooked – the demand. The demand that cannot – shall not – be blamed on the local fishermen and oystermen. Although it is inherent in human-nature that if you get something good in return, try harder to achieve more of it, it is true not only for business but our (consumer) habits as well. The overfishing of oysters would not happen without our increasing appetite. Mangrove habitats are rich in organic content. What makes a mud forest so diverse is the constant motion of the tide. Cut this lifeline, and the forests are dead – as is happening in many parts of mangrove forests today, only for us to scour a plate full of seafood. So, bund walls built around these serve as a rich breeding ground for fish, shrimp, mollusk and oyster culture – suffocating the mangroves and resulting in the death of an entire ecosystem. The delicious seafood we eat, the fried prawns we relish, we do not know what has gone into culturing them. For all we know, the shrimp you’re eating were most likely bred after suffocating mangroves, squeezing the life out of the flora and fauna of the intertidal zone, and killing the biodiversity found only in the mud forests. When I suggest that we must stop eating rice too, we reach a paradox. This paradox cannot be solved without the mutual consent of all the stakeholders involved – you and me – the consumers; farmers – the producers; and mangroves – the sufferers. It is when we reach a common area “a sustainable solution”, we realize that for all of us to exist, we need to adjust a little. The beauty of mud forests lies in relishing and admiring its richness with minimum disturbance, and getting what you get in the most sustainable way. Some of you may wonder that you play no role in destruction of a wetland – any wetland – but we all do, and it should be a grave concern to us all. The reward of keeping this ecosystem undisturbed for our survival is invisible but priceless; the aftermath of its destruction, however, is unimaginable and apocalyptic.